The Von Nieda Park Stormwater Management Groundbreaking and the Camden SMART Infrastructure Kick-Off! marked the start of green and grey infrastructure projects across the City to help mitigate flooding, enhance open space, and improve stormwater management. Click here to read about how Camden takes a grassroots approach to stormwater management. CITY OF CAMDEN ACHIEVES SUSTAINABLE JERSEY SILVER CERTIFICATION! On January 24, 2013, the Camden SMART Initiative, spearheaded by the City of Camden, Cooper’s Ferry Partnership, the Camden County Municipal Utilities Authority, the Rutgers Cooperative Extension Water Resources Program, the New Jersey Tree Foundation, and the New Jersey Department of Environmental Protection, hosted the 2013 Camden SMART Forum at the Adventure Aquarium. Over 100 SMART stakeholders from a multitude of organizations attended the event, which featured Camden Mayor Dana L. Redd's 2013 Sustainability Address and a presentation from Matthew J. Millea, Deputy Executive for Onondaga County, NY, entitled "Save the Rain," highlighting successful green infrastructure strategies from Syracuse, NY. At the event, Mayor Redd announced the Camden Collaborative Initiative (CCI), a partnership between the City of Camden, the United States Environmental Protection Agency, New Jersey Department of Environmental Protection, and local Camden non-profit and for-profit agencies to identify and eliminate gaps and barriers to sustainable development and smart growth. 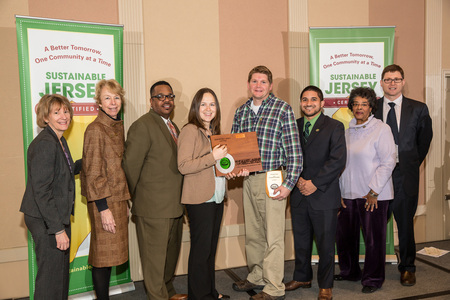 Donna Drewes, Co-Director of the Sustainable Jersey Program, also presented the plaque recognizing Camden's recent Sustainable Jersey certification to Mayor Redd and the Camden Green Team. 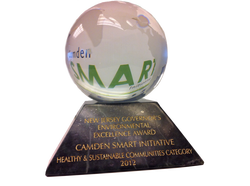 The Camden Stormwater Management and Resource Training (SMART) initiative has received the 2012 New Jersey Governor's Environmental Excellence Award. The Camden Stormwater Management and Resource Training (SMART) initiative is a collaborative project that focuses on developing a comprehensive network of green and grey infrastructure programs in Camden to minimize the severe flooding issues in order to restore and revitalize neighborhoods. For more information, click here. Read how Camden's gardens are helping alleviate stormwater flooding.